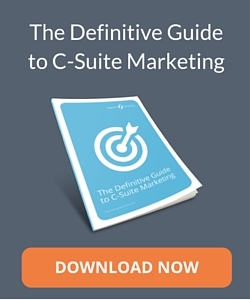 Email marketing is still one of the most effective marketing channels available in our toolkit. As B2B marketers, there’s a fine art to it that we often miss because we forget about one of the key things when marketing to other businesses. We need to remember that we’re talking to humans, not brands. We may be B2B but that doesn’t mean we should write like robots. We don’t speak like corporate documents face-to-face, after all, so why do it in an email? We send a lot of emails in our own business, and we’ve learned a lot about what works and what doesn’t. So today, I’m going to show you how to write emails that get opened, converted and build connections. When a new email lands in your inbox, what’s the first thing you do? You likely check out who it’s coming from and what it’s about. If your email is part of an inbound effort then you’re making your job much easier, because the recipient should already know and trust you. If they’re a cold contact then you need to put some extra work into your subject line. The subject line is essentially your headline. It gives the recipient a reason why they should open and why it’s of interest to them. When it comes to email, the shorter the subject line the better. Take Obama’s reelection campaign for example. He sent an email out to a list, from him, that simply said “Hey”. It’s what made this email the most successful in Obama’s entire campaign. Another example comes from BuzzFeed. Not exactly B2B, but it makes a great point. “Not cool, guys” has a conversational tone and inspires intrigue. They also had some great preview text that comes across as snarky – all helping to lure people in. Remember, the point of the subject line is to get your email opened. A mistake many marketers make is to use it to sell what’s on the other side of the email. That’s what landing pages are for. Each part of the email has its purpose, and the subject is to get it opened. Style is a subjective term, yet the style you give your emails holds a lot of weight with how well it does. The first thing to consider is plain text vs. HTML. As a B2B marketing agency, we prefer the plain text route. It’s personal, and comes across as if we sent it directly to our audience. In many cases we often do send it directly to our audience – and because of this we get a great response rate. Onboarding emails can often be the weight that tips a new client or user to making a decision in staying with you or not. Therefore, it’s important that you make people feel as special as possible. Lincoln Murphy has a great tactic he uses to make new users for his product feel special. The trick is to make it look like he’s taken an automated internal email and replied to it directly. You can read more about this at his blog. HTML emails do have their place, but they lose some of the personality. In some instances, using HTML emails can increase engagement and conversions. That’s why it’s important to test. 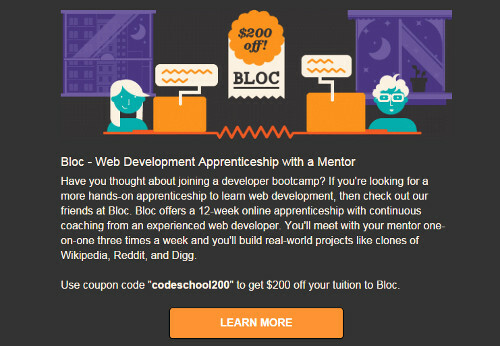 Code School have beautifully designed monthly emails that compel me to read through them every time I receive one. It’s a case of aligning the style with who your audience is. Code School focus on creative folk such as developers, designers and marketers – and so a creative approach works best. The words you use in the email contribute to the style, too. Take a recent email you’ve recently sent to your list and read it out loud. Does it sound like something you’d say to someone in a real life conversation? If your copy sounds too robotic then it might be worth making it more conversational. This depends on your target audience, as some people (especially in the B2B world) may not connect this way, but in our experience it works well. It’s no news that building a marketing message around a story helps to make a better connection. So why aren’t we doing it with our emails? I’m currently subscribed to several lists that send me daily or monthly emails, and every time I receive one I’m instantly hooked. There are two reasons I get sucked into these emails, first they hook me in with a story, and the second is they deliver value directly to me (which we’ll get into in a second). Stories help people to visualise the information they’re consuming. Not only this, it reveals your human side and allows people to connect with you. Remember, people connect with other people – not brands. This doesn’t just work for shoes. This works for any organisation trying to get their message heard. If people are opening your emails, then continue the journey through with a story. A good email nurturing system is one that adds value directly to the person reading it. If people know they’re going to get something truly valuable from you then they’re likely to stay subscribed. I see two methods of delivering value, both of which work very well. The first is by including a summary and link to an article, blog post or other piece of content. The email itself is usually very short and gets to the call-to-action quickly. The second method, which is one I’ve seen used with much more success in recent months, is by delivering value right in the email itself. This works well, because you’re delivering value (actionable value, at that) without asking for anything in return. It creates good will, and makes you feel part of an exclusive group of people getting insider info. But how does this contribute to your overall marketing goals? When the time comes to ask your audience to take some action, they’re much more likely to take it. Why? Because you’ve created the good will upfront and now they trust you explicitly. If you’re already using email as a nurturing channel, try flipping the approach. Instead of directing your visitors to a blog post, see what happens when you provide value right in the email itself. Then, when it comes time to guide them further down the funnel, ask them for the action and see what happens to your conversion rates. We know you love tactics and hacks that you can test right away, so I wanted to wrap this article up with some conversion boosters you can apply to your emails right away. 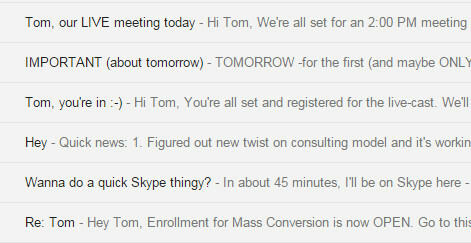 Bear in mind that these aren’t a cure for a bad email marketing campaign. If you’re missing out the basics then it’s unlikely that these tips won’t do much good. However, if you’re already seeing success and you want to take your results up a notch, then this is for you. Calls-to-action are an important conclusion to most emails (unless you’re giving value right in the email itself). Sometimes just inserting a link won’t do the trick. Make your calls-to-action pop by using big buttons. If your emails are of a plain text style, adding buttons can give it an extra dimension. Using a bold, bright colour will help make it stand out, and if using HTML then make sure it contrasts against the overall colour of your email. The same conversion optimisation rules apply here as they do on landing pages. If you’re sending regular emails – such as blog roundups or newsletters – it can be easy for readers to lose sight of your value proposition. Optimising your signature can be an opportunity to re-familiarise your audience with your brand. It also allows you to capitalise on space that’s usually used for generic information – logo, email address etc. This works for the signatures of your employees, too. If your marketing and sales teams are sending out emails on a frequent basis, including a link to a landing page in a call-to-action can make a huge difference. It’s all well and good sending out your own content, but there’s a whole world of great content out there that can be serving your audience. Instead of just giving away your own content, try giving other people’s content (OPC) out every now and then. This proves that the needs of your list is your priority, and can help build relationships with other influencers. Plus, writing great content can be hard. This helps take the load off. It’s a win-win-win for everyone involved. Having a no-reply inbox is so 1998. Why would you not want your audience to be able to get in touch with you? It’s important these days to be able to receive replies to your emails by including an address from a real person, but how about proactively encouraging people to reply? If you want to generate feedback, then this is the best way to do it. Why send people to a form when they can just reply to your email? It feels more personal and your audience won’t feel like they’re just another number. Just end your email with something as simple as “If there’s anything I can do to help, just hit reply and let me know. I read every email I receive”. It’s personal and real. I receive tonnes of email every day. I’m subscribed to a lot of lists and I want to keep on top of things in certain industries and companies, as well as what the influencers in my space are talking about. The emails that not only compel me to open but make me excited to receive all follow these rules and apply the elements covered in this article. If you think you’re not getting the most out of your email efforts then go back through this and see what you think is missing.